On May 2, 2006, Nordstrom announced their Nordstrom Product Group Design Internship Program winners with all three coveted positions awarded to Academy of Art University School of Fashion students. The competition entailed forecasting future Ready-To-Wear (RTW) trends by analyzing Haute Couture. Students were then assigned sketchbook development work for the women’s contemporary target market using the Fall/Winter 2006 season. This included a written description of their design concept, visual research, fabric, trim and color information, and croquis in color. Designs were then selected from their croquis with collections revised and edited before developing their final presentation of four complete outfits that were then presented to Nordstrom. MFA Fashion Design student Yoshimi Fukazawa who will be designing for Halogen, a Nordstrom private label womenswear brand aimed towards a younger customer. BFA Fashion Design student Laila Ghorban who will be designing for Caslon, a Nordstrom private label womenswear brand. BFA Fashion Design student Joon Pak who will be designing accessories. The competition also included students from Seattle Central Community College, Seattle Art Institute, and Seattle Pacific University. Nordstrom has grown from one downtown Seattle shoe store into a nationwide fashion specialty chain with renowned services, generous size ranges and a selection of the finest apparel, shoes and accessories for all ages. The company’s philosophy has remained unchanged for more than 100 years since its establishment by John W. Nordstrom in 1901: offer the customer the best possible service, selection, quality and value. 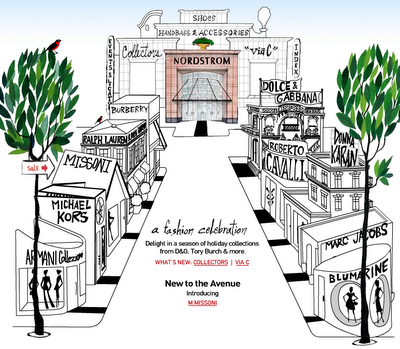 Nordstrom is a Hall of Fame member of FORTUNE Magazine’s “100 Best Companies to Work For” list.